The Drager FS-10 has been designed as a test torch in order of testing the function of the Drager Flame 1300 IR Detector, Drager Flame 1700 UV Detector and Drager Flame 2300 UVIR Flame Detector in hazardous areas. The simulation of the presence of fire or flames is carried out by the Drager FS-5000 in order to test the correct operation of the Drager Flame 5000 CCTV Detector. Testing at Range - The Drager FS-10 and Drager FS-5000 are both used to functional test their respective flame detectors from a distance. With reduced need for scaffold or ladders to access the detector, maintenance costs can be decreased. Drager FS-10 - The Drager FS-10 tests Drager Flame Detectors at distances up to five metres. 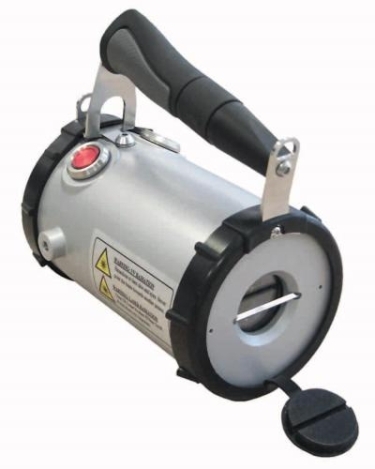 The Drager FS-10 is portable, batterypowered, and certified for use in potentially explosive atmospheres. The Drager 1300, 1700 and 2300 Flame Detectors respond to infrared and/or ultraviolet flickering radiation emissions. Accordingly, the Drager FS-10 uses a xenon lamp to emit a powerful beam of broad-spectrum radiation. It is pulsed in a pseudo-random sequence to simulate the varying emission of a flame. Drager FS-5000 - The Drager Flame 5000 CCTV Detector is a 'Visual Flame Detector'; therefore the Drager FS-5000 has been specifically designed to enable long range testing of this detector. The Drager FS-5000 is designed and built for extreme offshore environmental conditions. The electronics are housed in an enclosure which is designed for Zone 1 hazardous areas.